The cubic overview smells after the sock. School days have still been going by quickly. I’m hoping to go to Goodwill tomorrow. Today I looked at knitting patterns on Ravelry for a very long time. One of the patterns I came across was a pointed yellow gnome-type hat. I read the pattern’s description and found that it was based on a movie called “The Point.” Naturally, curiosity got the better of me and I searched it on YouTube. What I found was marvelous. 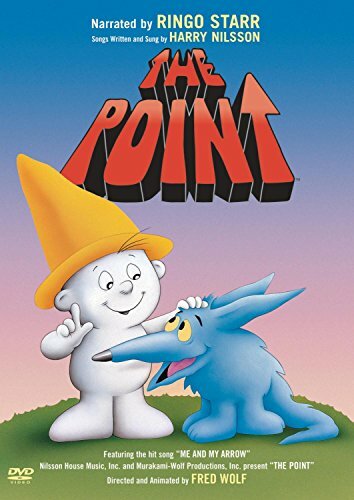 It turns out that “The Point” is a children’s movie made in the early 70’s (1971 to be exact). That alone would convince me to watch it, but then I saw that the narrator is RINGO STARR. So, of course, I had to watch it. I haven’t finished it yet, but I’m about forty-five minutes in and I really love it. I especially like all of the song in it. They’re absolutely lovely. They just don’t make movies like that anymore. I’m definitely going to be knitting the yellow hat some time after finishing the movie. I also knit much of a green beret. The pattern is based on 1930’s berets, which is what initially peaked my interest. I really like things with a past, a historical inspiration, I suppose this case would be called. I used this handspun yarn my mother gave me awhile back. It’s ridiculously soft. Lastly, I watched more of Ghostbusters, which I began watching the night before yesterday. I saw it quite a few times when I was younger, but after seeing about ten minutes of it in American Studies II class the other day (don’t ask…), I decided I needed to re-watch it for sure. Now I’m pretty far into it, and remembering why I liked it so very much as a child. Earlier today baked carrot cake cupcakes with cream cheese frosting with Lydia. I also watched one and a half episodes of Star Trek (all of “Requiem for Methuselah” and part of “The Mark of Gideon”). Last night, I went to sleep at 5 pm. I meant to take a quick nap, two hours, and even set an alarm to wake me up then. I didn’t hear it, though, and it was very strange to wake up at 8:21 am thinking it was still the night before. So, now I’m well-rested and all, and going to Wednesday club in under an hour. This morning I was watching home movies, from when I was two or so. It was strange not only to see everybody so much younger but also to hear everybody’s voices so different. The thing I love best about sleepovers is all of the hilarious spur-of-the-moment jokes and all in all the deliriously happy laugh marathons more effectively experienced when one stays up ALL NIGHT LONG. The playdate (what else do you expect me to call it?) at Rachel’s yesterday turned into a sleepover, and it was THE BEST. I always say that, I know, but friend gatherings get better each and every time. It was Kaitlyn, Rachel, and I, and let me tell you, Kaitlyn and Rachel are two of the most hilarious people ever. At one point we went on a walk, and the camcorder was out of batteries so we couldn’t shoot the movie but it was still the best, as I already mentioned. At 8 pm, Kaitlyn watched some American Idol whatsit or whatever on television, and during this time Rachel and I watched and acted out various Star Trek related things. There was a particularly memorable group of scenes in the dollhouse using the Spock, Kirk, and McCoy action figures (and also the adorable miniature Spock action figure Rachel got). Later there were also similarly memorable scenes involving us as redshirts, as Chekov and Charlie, and of course as the tried-and-true Spock and Kirk. During this particular sleepover, there was a positive overabundance of fanfiction reading. We managed to plow through quite a lot of EXTRAORDINARILY humorous ones, such as Hey Arnold ones and Lord of the Rings/Brady Bunch crossovers and lots and lots of Star Trek related fanfiction, of course. There were so many gems. The Hey Arnold ones were some of the best, especially Kaitlyn’s “Gerald voice,” as we named it after she used it when acting out the character of Gerald from Hey Arnold. It was a sort of Jamaican accent, and quite endearing. Unfortunately, Kaitlyn had to leave at 9 this morning, though after she left we discovered the greatest fanfiction writer in the history, Storyprovider. He is Finnish, and absolutely darling. He weaves such masterpieces as Superman and Stalin the Love Story and other such winning tales. P.S. Gomer Pyle may sound vile, but do not worry, for he is not. Today Billy Mays died. I found that I was actually a lot more upset upon hearing about his death than I was about hearing about Michael Jackson, Farah Fawcett, and Ed McMahon’s deaths. I think that’s because Billy Mays always seemed so healthy, and I saw him in his commercials on a regular basis. I’m pretty sure I wrote about him in a post sometime in the past few months, about how his commercials made me want to buy the product advertised no matter how useless or mundane a task it involved. His enthusiasm, his spirit, and all else about him will be sorely missed. I even bought mighty putty after being so persuaded by the mighty putty commercials. I still have it and it smells awful and has never been used, but now I can keep it as a sort of memory for the wonderful man who enthused me into buying it. Today I went to work with my father, and it was terribly dark and scary when I looked down the halls. While I was doing puzzles from my Brain Puzzles book in my dad’s office, we heard this terrifying sound like somebody being put under one of the deepest forms of torture, Count Rugen’s pain machine at the third notch, perhaps. It was horrible. Later, once we arrived home, I knit three quarters of a purple slipper and then frogged it all. While doing this, I watched maybe three episodes of Doctor Who as well as one episode of Star Trek. Tomorrow I’ll be babysitting until 4:45 ish and then heading over to Rachel’s house. We’re going to do our first filming of the horror movie and it shall be MARVELOUS. It’s going to be horrifyingly difficult to keep from laughing, but luckily laughing can often be disguised as crying or screaming, so maybe it will work to my advantage. It will be extremely fun, either way. I “squee”d a lot today. Why? BECAUSE THE STAR TREK ACTION FIGURES ARRIVED. And no, not only that, but also the CD arrived! I took an extraordinarily grandiose amount of pictures, but I still haven’t found my camera cord and so I still can’t put up any pictures. The figures are amazing, though. Really. McCoy’s hands are of course perfectly formed for grabbing and unable to hold the phaser Kirk comes with. Spock looks very fitting holding his science tricorder, and McCoy looks like… well, McCoy… when he holds his medical tricorder. The CD is great and I’ve been listening to it for ages. In addition to these fantastical happenings, I am soon going to be going out to dinner with my grandparents, ALL BY MYSELF. This has never happened before, the the best of my knowledge. Other than fooling around with the CD and action figures, today I did some knitting and… pretty much nothign else. Oh, but Abie made me a three-dimensional U.S.S. Enterprise out of paper, and it it FANTASTIC, and so I spent awhile finding the perfect place to hang it up in my room. OH OH OH, I just remembered something else I did: I made a Star Trek notebook out of the Star Trek cereal cereal box! I did this by cutting the cover and back cover off of a blank spiral notebook, and then I glued the box in in some way, and it all left me with the GREATEST PLACE EVER for writing down my thoughts in. Coincidentally, I actually began to write in the journal I got for my birthday from my aunt and uncle about a week ago. I’ve been writing in it every night since then. Well, I’m supposing it’s very nearly the time to go out to dinner, so goodbye. I still haven’t found my library book, in case you’re wondering, though I’m guessing it will show up the day after I end up paying for it. The same thing happened with The Phantom of the Opera. science fiction movies, especially ones from the 1970s. The 1970s was a very, very good decade for all those science fiction movies (WILLIAM SHATNER COVER REFERENCE). You know what I mean. I have, however, noticed that a lot of the movies follow the same basic concept, a la Invasion of the Body Snatchers and Stepford Wives. People are replaced with robots, or something else that isn’t themselves, anyway. Still, I don’t think I’ll ever bore of this concept, as there are an infinite amount of ways it can be played out and each one is enjoyable. What brought this brief rant on is my watching Futureworld today on On Demand (it’s really very handy, even if most of the movies sound pretty ridiculous from the descriptions) in the free movies section. It turns out Futureworld is actually a sequel to Westworld, which I’ve heard is better, as the original, than Futureworld is. I thought Westworld might be on YouTube, but it’s only there in Spanish and so I suppose I’ll have to rent it on Netflix like a pre-YouTube person. I also need to rent Jurassic Park. I read the book awhile ago and loved it, last year maybe, but I never did see the movie. I still haven’t found my lost library book, unfortunately. It’s hardcover and so if I can’t find it I’ll have to pay an awful lot to the library, in addition to the four dollars in overdue DVD fines that I never did pay. Well, other than the above and the rather uninteresting matter that I went to the dentist today to get sealants on my teeth, I am at a loss. Summer has been rather decent to me thus far (or summer vacation, anyway- I don’t think summer actually starts until this Sunday, on Father’s Day) and I hope its good vibes continue. P.S. None of the Star Trek stuff I’ve purchased has arrived yet, and I will dutifully check the mail each day until then.